November 27, 2012 -- CHICAGO - A variety of new technology is on display in the RSNA booth of GE Healthcare, ranging from an automated breast ultrasound (ABUS) scanner to MRI noise reduction techniques. The vendor will also highlight new image viewing software that unifies its PACS and advanced visualization applications into a single viewing platform. In healthcare informatics, GE is launching Universal Viewer, a new zero-footprint image viewing software platform that combines functions previously found separately in GE's PACS and advanced visualization workstations. The genesis behind Universal Viewer is the reality that radiologists are spending more of their time processing data rather than reading images, according to the company. In fact, some surveys have found that up to two hours in a typical radiologist's day are wasted due to workflow inefficiencies. Such inefficiencies include forcing radiologists to use different workstations for PACS and advanced visualization functions. Universal Viewer enables radiologists to access -- on any computer with a Web browser -- data from the company's Centricity PACS and Centricity PACS-IW software applications, as well as advanced visualization data from its Advantage Windows (AW) software. Users can now move seamlessly from 2D to 3D image interpretation without having to change computers, the company said. GE has also created a unified user interface with Universal Viewer, so users no longer encounter a different user environment when they switch from one reading mode to another. The new interface is the product of major investments GE has made in user interface design and what the vendor calls smart reading protocols to further improve its usability. GE is launching its Universal Viewer software platform. For example, a radiologist could configure Universal Viewer's reading protocols to meet his or her preferences for certain studies, and the software would remember those preferences the next time the radiologist reads a similar exam. GE estimates that the feature can reduce up to 70% of the mouse clicks needed before radiologists start reading studies. Finally, GE has added specific applications for reading images from the bulk of the clinical studies that radiologists encounter in an average workday. These include protocols for oncology quantification, vascular imaging, bone addition or removal, and volume view, which synchronizes between 2D and 3D images. Universal Viewer received U.S. Food and Drug Administration (FDA) clearance the week before the RSNA meeting, and shipments to the U.S., U.K., Germany, and Japan begin in December. Shipments to the rest of Europe begin in the first quarter, and Asia shipments will begin at a later time. 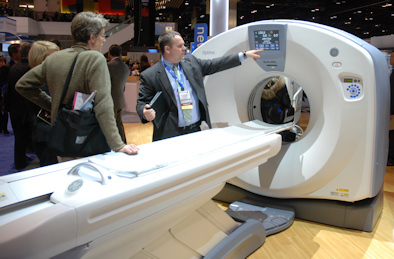 GE is launching two new MRI scanners at the RSNA meeting, Optima MR360 Advance, a premium 1.5-tesla scanner in the performance market segment, and Brivo MR355 Inspire, an easy-to-use magnet designed to have a low total cost of ownership. Both scanners are available with the company's Express coil technology, designed to make it easy for technologists to set up patients, as well as its OpTix Optical RF technology, which offers high channel counts and analog-to-digital signal conversion inside the scan room but away from patients for better comfort and safety. GE believes that OpTix provides up to 27% higher signal-to-noise ratio. Optima MR360 Advance and Brivo MR355 Inspire do not have FDA clearance and are being shown as works-in-progress. GE's new Optima MR360 Advance. Another MRI highlight is SilentScan, a new technology designed to reduce the noise inherent in MRI procedures. The loud, clanging din of MRI is a familiar refrain to anyone who's had an MRI scan. Produced by the switching of the scanner's gradient coils and radiofrequency (RF) signals, the noise can measure up to 110 decibels -- as loud as a rock concert. The noise contributes to patient discomfort and can be a factor in uncompleted MRI exams. GE has developed a new MRI protocol called a Silenz sequence that acquires k-space data radially rather than in line-by-line fashion, eliminating the need to switch gradients -- and thus reducing much of the scanner's loudest operating noises. Silent Scan reduces scanner noise to 40 to 50 decibels, about the level of ambient room noise, and GE is showing the ability in a live demo transmitted via video link with a scanner installed at its headquarters in Waukesha, WI. SilentScan is pending FDA clearance and is being shown at RSNA as a work-in-progress. GE plans to roll out the technology for all its MRI scanners, including Discovery MR450w and Discovery MR750w systems. In other MR-related news, GE is showing MR-guided focused ultrasound (MRgFUS) technology from InSightec, the Israeli firm in which GE made a $31 million investment in October in exchange for a large equity stake. InSightec recently received premarket approval (PMA) for using the technology to treat patients with bone metastasis. Standard of care for these patients is either narcotics or radiation therapy, but MRgFUS could be an alternative to ablate tumors and alleviate pain noninvasively. InSightec has already developed clinical applications for the technology in treating uterine fibroids. 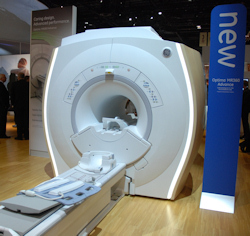 GE is making the technology available on its line of MRI scanners. Finally, GE has expanded its Caring MR Suite concept, which creates soothing environments to calm jittery patients, to the Extremity Optima 430s extremity scanner. The concept, introduced at last year's RSNA show for the Discovery MR750w and Optima MR450w scanners, lets patients choose mood lighting, visual scenery, and musical backgrounds for their MR scans. The big news in the molecular imaging section of GE's booth is Discovery PET/CT 610, a new hybrid PET/CT scanner. The company is touting the new system's sensitivity, which GE has measured at an absolute sensitivity of 10 cps/kBq. GE believes that the scanner's high sensitivity enables it to acquire the greatest number of counts, which translates into faster scans at lower radiation dose. The system is optimized for fluorine tracers and is currently shipping. GE is also discussing the wide range of clinical applications available on the system in its Q.Suite package, intended to minimize and manage variability and enable repeatable accuracy for measurement of standardized uptake values (SUVs) from one exam to the next. These include Q.Freeze, which provides full-thorax motion-free PET/CT in less than three minutes, and Q.AC, which reduces CT attenuation correction doses to levels of 0.3 mSv for whole-body and 0.02 mSv for brain scans. On the SPECT side, Discovery NM/CT 670 is a gamma camera that can be purchased as a single-head unit and later upgraded to a dual-head configuration. GE has recently changed the system's CT detector to provide better image quality at lower radiation doses. The company is also showing digital cadmium zinc telluride (CZT) detectors on its molecular breast imaging (MBI) and cardiac gamma cameras. The firm's general-purpose cameras still employ detectors based on scintillation crystals, however. In dose reduction initiatives, GE is highlighting new additions to its Blueprint dose reduction program, which was launched earlier this year. The vendor has now published a CT guidebook developed in partnership with Weill Cornell Imaging at NewYork-Presbyterian that describes the success the institution achieved in reducing dose without implementing new technology. GE has also inked an agreement with the University of Wisconsin School of Medicine and Public Health to license its dose-optimized CT protocols. The suite of protocols, which will be regularly updated, will be made available along with GE reference protocols to GE customers. The protocols will initially be available for GE's Optima CT660 and Discovery CT750 HD scanners. Furthermore, GE is discussing version 1.2 of its DoseWatch reporting and tracking software, which now also provides CT size-specific dose estimates. GE is also presenting a tool that providers can use to talk about their dose-reduction investments to commercial payors in hopes of increasing reimbursement. On the big iron side, GE is announcing the availability of three scanners, Optima CT660 Freedom Edition, Optima CT540, and Discovery CT750 HD Freedom Edition. GE's Optima CT660 Freedom Edition scanner. Optima CT660 Freedom Edition features GE's Motion Freedom protocol for coronary motion correction, which is able to "freeze" coronary motion at higher heart rates with GE's SnapShot Freeze protocol. 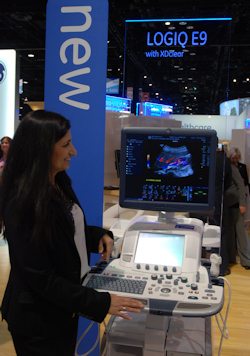 Users can perform one-pass cardiac scans, with images reconstructed in real-time, and can use the company's VolumeShuttle technique with 80 mm of extended coverage. Meanwhile, Optima CT540 is now available throughout the world. The scanner has an updated user interface, enhanced workflow updates, and dose reduction designed around GE's adaptive statistical iterative reconstruction (ASIR) protocol. The company's Xtream workflow management tools have also been improved for better user productivity. GE acquired automated breast ultrasound (ABUS) developer U-Systems earlier this month and is displaying the somo.v ABUS system in its booth. Somo.v, which received FDA approval in September for use in screening women with dense breasts, has begun shipping in the U.S. The company plans to make the system available worldwide upon receipt of necessary regulatory clearances. The somo.v ABUS system from U-Systems. GE is also directing attention to its new Logiq E9 with XDclear general imaging scanner. GE's XDclear transducer technology on its new C1-6 and C2-9 transducers increases signal penetration depth, yielding image quality enhancements in larger, difficult-to-image patients, according to the vendor. GE has also included its B-Flow imaging capability on Logiq E9 with XDclear. B-Flow employs non-Doppler technology to display hemodynamics and provide blood flow visualization, GE said. The scanner has also been outfitted with workflow tools such as Compare Assistant, which helps streamline comparison exams. Breast and thyroid productivity packages are designed to help optimize these measurement-heavy studies, according to the vendor. Logiq E9 with XDclear also features volume navigation enhancements such as automatic CT registration, GE said. In other ultrasound developments, GE is highlighting Logiq S7 Expert, a shared-service scanner that can handle a range of applications such as abdominal, vascular, musculoskeletal, cardiac, ob/gyn, and small-parts imaging. It is also capable of elastography. GE's Logiq E9 with XDclear. GE has been making major investments in recent years to improve the patient experience, and the concept has been extended to women's imaging with SensorySuite. SensorySuite enables women who are receiving mammograms to create a more soothing environment to reduce anxiety. Patients are able to control their visual, auditory, and even olfactory environment to create a spalike experience that mammography centers could use to gain a competitive advantage while also improving screening compliance rates. Displays in the scanning room can be adjusted to show nature scenes, while soothing sounds such as ocean waves or running water play in the background. Aromatherapy scents are also available. The entire experience can be controlled by patients, even at high-volume mammography centers that are imaging a new patient every 20 minutes. Several orders for SensorySuite have already been placed. In surgical imaging news, GE is debuting OEC Elite + Venue 40, an integrated fluoroscopy and ultrasound unit. OEC Elite + Venue 40 combines GE's OEC 9900 Elite mobile c-arm with its Venue 40 tablet ultrasound scanner, which allows for fluoroscopy and ultrasound to be viewed on a single workstation. 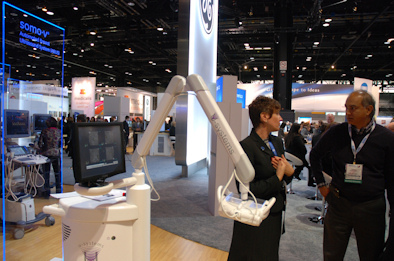 Venue 40 is mounted within the OEC 9900 Elite C-arm's workstation, allowing surgeons to access it when needed, GE said. GE is also discussing WSP (Wireless Service Platform) for the OEC 9900 series, which supports wireless transfer of images as well as USB image storage. WSP is expected to begin shipping in early 2013. In addition, the company is demonstrating a new reference monitor for technologists for use with the OEC 9900 series. The monitor is also scheduled for an early 2013 release. In work-in-progress developments, GE is showing OEC Brivo 865 Advance, a dedicated orthopedic and general surgery system that will provide a value-oriented option for customers who don't need a fully featured OEC 9900 system. GE is also unwrapping its FlightPlan for Liver imaging tool, which recently received FDA clearance. FlightPlan for Liver helps interventionalists plan liver embolization procedures by aiding identification of vessels feeding liver tumors, according to the company. Physicians select the tip of the catheter and a hypervascular tumor on a 3D image, and the software then highlights vessels traveling from the catheter to the lesion's vicinity, GE said. FlightPlan for Liver is available with versions 4 and higher of GE's AW VolumeShare image analysis and review station.